The Polish Poster School of the 1950s and 60s casts a long shadow over graphic design. Employing Surrealist collage techniques and hand-drawn illustration, figures such as Henryk Tomaszewski and Roman Cieślewicz are celebrated for their idiosyncratic approach to image-making. They are credited with resisting the intellectual poverty of communist ideology with individualism and artistry. Forty years later, young designers in Poland still have to step out of their deep shadows to make their own careers. This monumental reputation also works retrospectively: the history of graphic design seems to have only one Polish story, the postwar poster. Piotr Rypson’s Against All Odds: Polish Graphic Design 1919-1949 is a rich repository of alternative histories. Playing down the poster in favour of a much wider range of printed objects including avant-garde programmes and popular magazines, postage stamps and letterheads, Rypson examines the different faces of Modernism in Poland from the revival of the nation at the end of the First World War to the imposition of Stalinism in the late 1940s. He is an expert guide, supplying fast-paced narratives about the commercial, state and political clients for whom graphic designers worked. He moves between avant-garde manifestos such as Władysław Strzemiński’s ‘Functional Printing’ of 1935 and anonymous ephemera, tracing how the austere principles associated with die neue Typographie found their way on to the pages of magazines and trades union booklets. 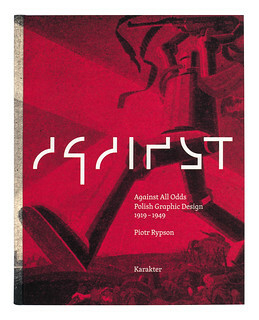 Cover of Against All Odds designed by Przemek Dębowski. 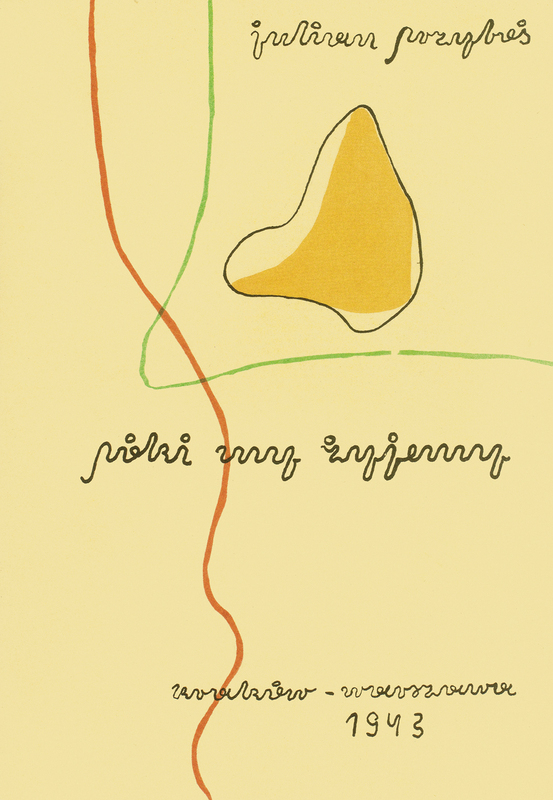 Top: Maria Jarema’s cover for Póki my żyjemy, Julian Przyboś’s experimental poetry collection, from Against All Odds. These histories are not, however, the major achievement of Rypson’s book. This lies in the extraordinary range of illustrative examples that have been gathered between its boards. I doubt whether ten per cent of them have been republished before. And the effect is enlightening. The diverse expression and widespread adoption of photomontage stands out: Mieczysław Berman’s steely posters for left-wing parties seem to follow blueprints drawn in Weimar Germany and Soviet Russia, whereas Janusz Maria Brzeski’s photomontages for Tajny Detektyw (‘Private Eye’) magazine in the early 1930s have a kind of élan that combines Dada with Hollywood. The decision to cover the 1940s is a good one. Most design histories follow the chronology of world events or the regular rhythm of decades. Rypson is making a point: the Second World War did not mark the end of free publishing or imaginative design but the formation of a one-party state at Moscow’s behest in 1949 did. There are some poignant wartime stories here. Maria Jarema produced truly extraordinary hand-drawn abstract covers for a hand-written book of experimental verse by Julian Przyboś in 1943. Produced in an edition of just ten copies, these books asserted the power of the human imagination in the face of occupation, censorship and destruction. I am also struck by the unintended irony of the photomontage cover of Obrona Warszawy (‘The Defence of Warsaw’), a booklet produced in 1942 by Polish Jewish socialists in New York. Designed by Teresa Żarnowerówna, a one-time Constructivist living in the US as a refugee, the book announces the fate of her hometown, in the hands of the Germans. It is a bitter irony that she, like many avant-garde artists in the 1920s – had seized on the fragment as both a kind of metaphor for Modernity and a revolutionary device to hasten the modern world into being. Tradition was to be dismantled with the dynamism of montage. But by 1942, the fragment, in the form of broken bodies and shattered buildings on the cover of Obrona Warszawy, was a tragic demonstration of the destructive power of modernity. 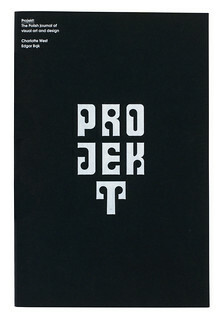 Cover of Projekt designed by Spin. For Rypson, 1949 marks a kind of fault-line. By then, many of the figures who feature in his book were victims of the Second World War; dead or forced, like Żarnowerówna, to flee the country. The onset of Stalinism was by no means the end of Modernist graphic design in Poland, as Unit Editions’ modest book shows. Reviewing the activities and appearance of a very animated art and design magazine first published in 1956 after the dark years of Stalinism, Projekt: The Polish Journal of Visual Art and Design, gathers covers and spreads by a new generation of designers and artists most of whom made their careers in the People’s Republic. 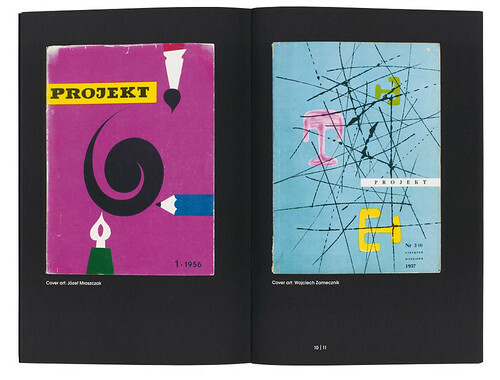 Spread from Projekt, showing early magazine covers from 1956 and 1957. Published in three languages, Projekt was a major vehicle for the promotion of the Polish poster abroad and, in fact, eschewing cover-lines, portraits and the other conventions of commercial publishing, the magazine’s covers functioned as diminutive posters. Charlotte West’s well informed introductory essay places less emphasis on interpreting these designs than in examining the relative freedom of the editors to shape its content in the face of censorship. By steering clear of politics, they ensured that the cultural apparatchiks left the magazine and its editors alone. As a result, Projekt became a remarkable champion of Modernist graphic design on both sides of the East-West divide during the 1960s and 70s. In the early 80s, when the authorities imposed martial law in an attempt to suppress the Solidarity anti-communist opposition, this strategy became untenable. Projekt’s editors attempted to report the visual language of protest and, expecting censure, announced their collective resignation.